Great Place for the money. Large apartment, with semi-enclosed balcony to the rear of each apartment, with garden furniture, and a clothes bay drying to the front. There is no air condition, but the breeze can pass through the whole apartment, so no need. Bedroom furniture was disappointing, as there was not enough drawers, but there is a safe. Bathroom quite spacious, and includes a bidet. Onsite cafe ok, so was the pool. Kids had their own play area and pool, which kept the main pool quieter. It was nice to be able to shop just across the road, at the Spar supermarket. The beach and promenade is a short stroll (3 minutes) away. Puerto Del Carmen has 2 miles of georgeous beach and shopping, which has been tastefully designed. The place fely safe, and a decent atmosphere until late. No drunks or louts like Tenerife. Some entertainment on site, but two large sites across the road, are also free to enter. Staff were helpful, particularly when we had some trouble with the car rental company. Very memorable place, from which we explored this classy Island. We stayed in the Aguazul Apts for 2 weeks and it was a most enjoyable stay there. The reception staff were very hospitable and helpful. We did not use the facilities at the pool bar, but we did use the downstairs bar at nite & the guy there was lovely, the bar itself is beautiful and we were made very welcome there. The pool is heated and at its deepest is 1.45m so ideal for children. There is also a children's pool (which is not heated), a children's play area. The aguazul apts were pretty basic. We knew this when we booked the holiday. The front & balcony of the room faced the sun all day, that was not too bad, but the bedroom & living room was extremely drafty & cold. We used towels as draft excluders. The sun never reached the bedroom which felt at times quite damp. The floors were cold under feet with no carpets or rugs. We asked reception for 2 extra blankets, this was on the first night, they replied that the apts were full & they did not have any spare blankets. So i asked the receptionist to try & source more blankets, she said she would try. But for the 14 night stay we did not recieve anything. The pool was fine, the location was fine, approx 150 metres from the main road & night life. We will not be staying here again. This was our second new year in puerto del carmen shame our accommodation wasn't as good as the 1st time.Checked into our room first impresions seemed ok untill i opened the curtain to go on the balcany and the curtain rail fell on my head, went into the bathroom and there was no door or curtain on the shower hence every time we had a shower the bathroom was flooded. Furniture in the bedrooms was terrible drawers fell apart as you opened them.Maid service was awfall didn't have our room cleaned for three days had to complain someone finally came to do the room but could of done a better job myself.Sheets didn't fit the bed we had 5 single sheets on a double bed it was like sleeping under a jigsaw puzzle! !four out of five of us were ill with tummy bugs which we probably picked up from the dirty pool which i never seen anyone clean, bins around the pool were not empted for days we will not be returning. 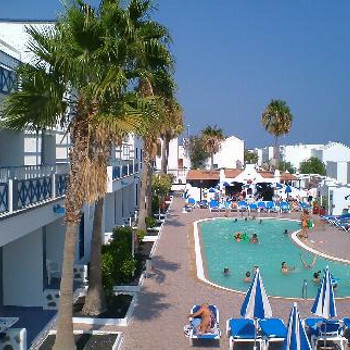 We could not fault the cleaniness of these apartments,the housekeeping crew are some of the best we have had and we travel quite a lot,we did eat breakfats and lunches at the complex and the food was very nice. The staff were all very friendly maintenance crew to reatuarant,reception,cleaners you could not have wished for anything better. The location was very handy to reach all the places to eat of an evening.and lovely walks along the seafront in the daytime,very handy for the beach if you prefer.There was no rush to get a sunlounger in the daytime there were more than enough to go round and parasols as well if you require one. The pool area again was very clean and the pool. [both were cleaned every day].The only two downsides to these apartments from our point of view were you do get noise from the complex over the road up till about 11.30pm on certain nights of the week, and the other one is there was no drawers to put underwear etc, plenty of wardrobe space and for shoes on the bottom of the wardrobe. i will end by saying yes we would go ther again. These apartments are clean and quite spacious, you can tell they must have been refurbished in the last couple of years. They are located about 200 yards up from the main 'strip' which runs all along the coast for about 4km where you will find all the bars and restaurants. Ours was a 1 bedroom apartment so the room had a sofa with a pull out section for another bed. Not that much sitting space but plenty of eating space as it had a table and chairs in the room as well as the large balcony. The room had a decent oven and hob, kettle, toaster, but no microwave which would have been useful. No air-con so it can get hot in the rooms at night if you shut the doors, but we left the doors to the bathroom and bedroom open which allowed the cool breeze to flow through. They are quiet, with no music blaring out round the pool, but go in the pool bar area there's a couple of plasmas playing MTV etc. We have stayed here before because of the location. The complex is quiet but the rooms are big, especially the balcony and there are no hills to climb! There was a 'quiet area' in a garden underneath our apartment which we used a lot to sunbathe and read. Lunch by the pool was good and the whole place was spotless. We will probably stay there again because everything is so close and hassle free. We had a very pleasant stay at the Aguazul. The staff were very friendly and helpful. The apartments were modern, fresh, bright & clean. Housekeeping called every day. Plenty of sunbeds & parasols were available at the poolside. Ideally situated 5 mins walk away from the busy strip and beach. Supermarket and lovely italian restaurant across the street. We returned home today from a fortnight in the Agauzul apartments in Puerto del Carmen. We had a lovely two weeks holiday and were very happy with the complex. The kids club was enjoyed thoroughly by all our children, aged 10, 8. 6 and 3. They were more than happy to cater for all ages in the club and the kids couldnt wait to get down there every day, the kids club reps were lovely too and very good to the kids. The entertainment in the poitin still was very good and their food was excellent, as were the prices. The apartments were quite basic but then, we didnt go on hols to sit in apartment and it did us fine for what we needed it for-sleeping in and the odd snack. I did note the absence of a washing machine however and spent in excess of 100 euros in a local launderette over the two weeks... Next time a washing m/c will be a must when booking with 4 small kids. Lastly the apartments were located about 3-4 minutes walk from the main strip where all the shops, restraunts and pubs are so its close enough to walk but far enough away so we didnt hear any noise at night once we went back to the room.....apart from the nightly entertainment from the complex accross the road but this finishes up at a decent hour!!! All in all an excellent holiday enjoyed by us all, we are very sad to be home but intend to book our next holiday in the next few weeks for next february and will be hoping to return to aguazul. a big thank you to all the staff who made our hols so enjoyable. thought I was getting a bargain at that until the after taste in my mouth. Entertainment for family low quality poor acts. Must be honest reception service was 10/10, Very helpful. But in desperate need of Modernization upgrade ASAP. Very disappointed on arrival with family.